"Traffic, shops, restaurants and a little more traffic"
Most workers in Seattle drive, a few use public transport, some bike and at least two of them walk to work. Fourth Avenue seems to be a hub for traffic and intercity activity. With several large hotels and the convention center in the area, evening traffic is often just as bad as rush hour, but the area is definitely worth the trouble. Several parking garages give you a spot to put your car while you peruse shops at Westlake Center, Pacific Place and the myriad of specialty shops along 4th Avenue's shopping district. The north end sports more small storefronts and several condo and apartment buildings. There's never a shortage of excellent restaurants along the avenue, and several exceptional ones don't necessarily advertise on the street, so be on the lookout for those hidden gems! The Seattle Public Library in all it's hideousness provides a main entrance from 4th Ave. where you can enjoy some quiet reading and relaxing. And in case I haven't mentioned it, it's one of the busiest traffic streets in downtown Seattle. 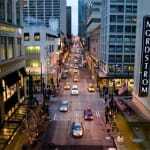 "Great shopping mall and lots of hustle and bustle"
Along 4th Avenue in Seattle is where you will find lots of shopping venues. In particular, the Westlake Center Mall can be found here at about the 1600 block. Westlake Center is one of my favorite places to shop because of the variety of stores and the convenient parking garage. The parking rates in the garage are a little spendy but reasonable for Seattle. An hour will cost you about $8-$10. Arriving at the mall on Saturday or Sunday is cheaper but you will have to fight the crowds. The rest of 4th Ave is bustling as well and gives you the feel that you are truly in the city of Seattle. Coffee shops and business venues populate the area and traffic is constant yet steady. This is the not the street to be on if you are looking for a nice Sunday drive in the country. Going north on 4th Avenue will take you straight to the main shopping hub of Seattle. The Westlake Center Mall is conveniently located on 4th Avenue and Pine Street. Westlake Center has plenty of shopping and the south station for the monorail to the Seattle Center. Also on 4th and Pine is Macy's department store. Further north is Bed, Bath, and Beyond. This is truly the premier shopping hot spot of Seattle. "Doing some research or simply getting a cup of coffee?" This street makes you feel as though you're in a bustling metropolis. The public library is located here and adds a great deal to the city's skyline. The library is a glass work of abstract art and boggles the imagination. Nearby are some much older building with constrasting architecture. This street has quick acces into the heart of the city or down to the waterfront. THere are plenty of coffee shops and good views of the Space Needle. While this areas is less touristy, there is still plenty to do. Geocachers in the area will find some neat hides here.